Alberto Battistelli sits on the wall and smiles for his close-up. Photo by Rachel Phelps / Gonzaga in Cagli. 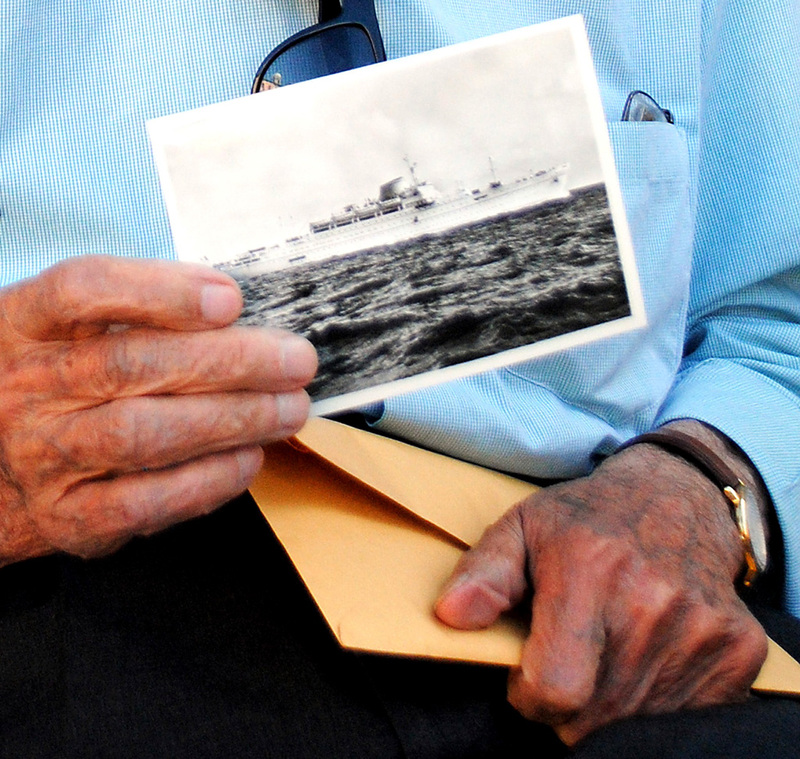 Alberto Battistelli holds a picture of the ship that took him to Malawi. Photo by Rachel Phelps / Gonzaga in Cagli. 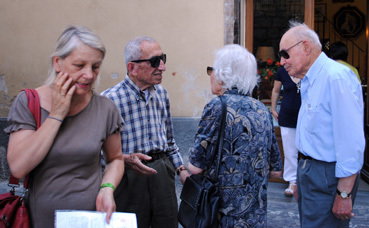 Alberto Battistelli talks to some townsfolk near the piazza. Photo by Rachel Phelps / Gonzaga in Cagli. 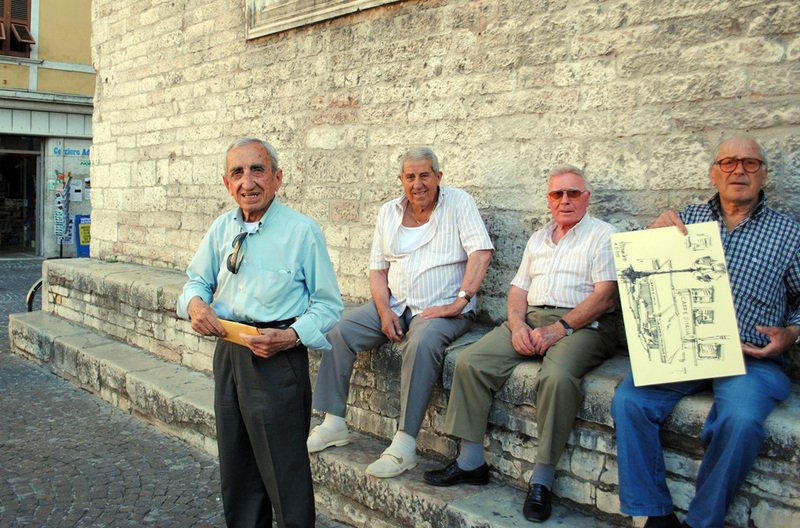 Alberto Battistelli stands in front of the other men on the wall. Photo by Rachel Phelps / Gonzaga in Cagli. 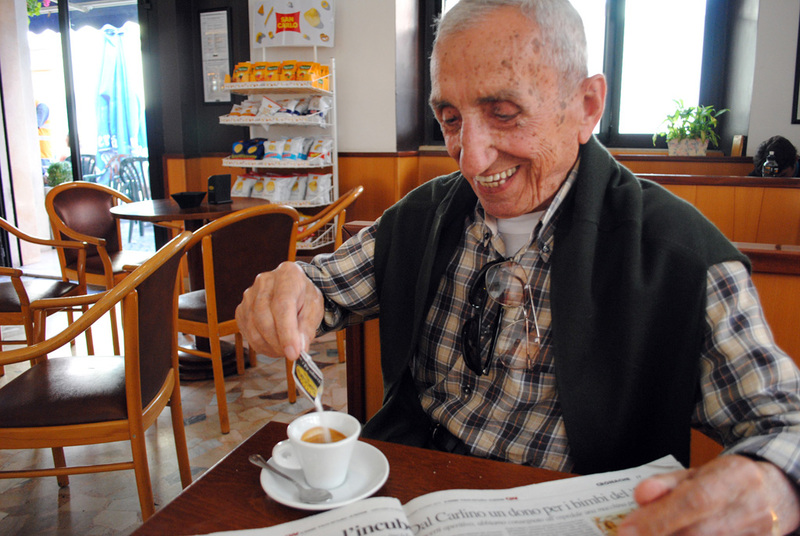 Alberto Battistelli grins as he pours a packet of sugar into his espresso. Photo by Rachel Phelps / Gonzaga in Cagli. 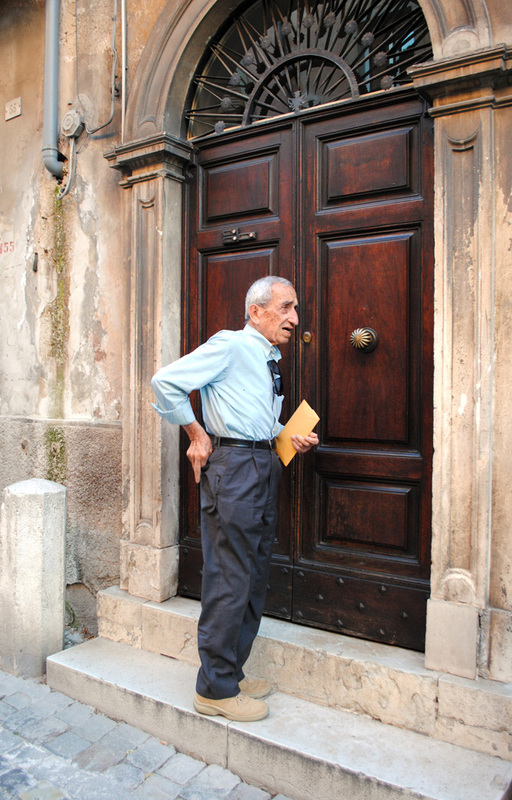 Alberto Battistelli reaches for his keys at the doorstep to his apartment. Photo by Rachel Phelps / Gonzaga in Cagli. 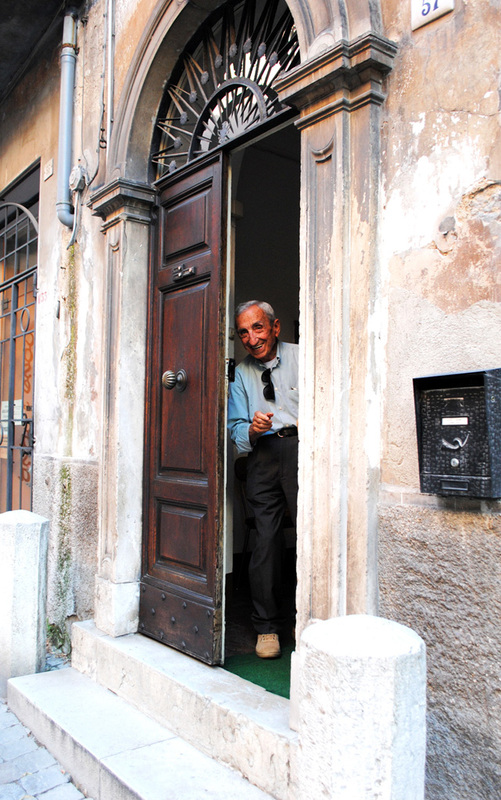 Alberto Battistelli leans out his doorway to say goodbye. Photo by Rachel Phelps / Gonzaga in Cagli. Antonio Costantini, or “Little Tony,” isn’t little. His massive hands toss chunks of raw pork with ease. 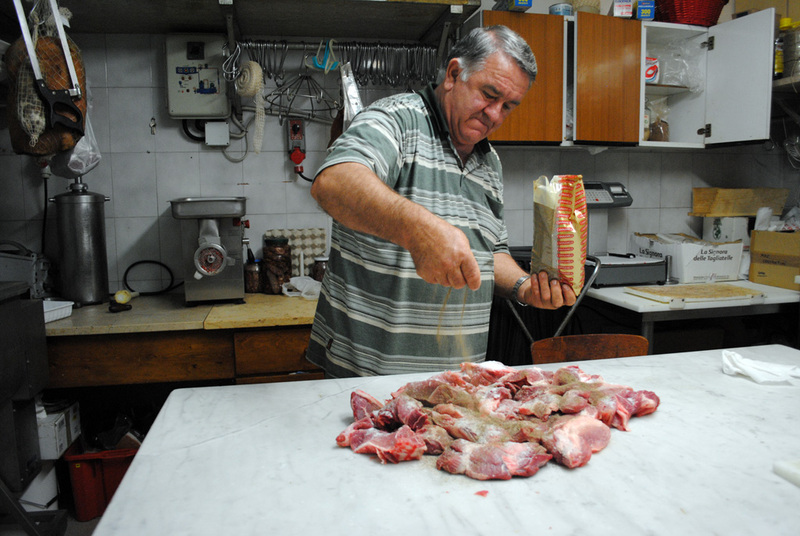 He flops pig parts onto a table to prepare for the grinder and sprinkles the pork with salt and pepper. Seasoning sausage with only salt and pepper is key, he says. Simple is good. If the meat’s good enough, it should stand on its own. “Those who know how to eat well know where to come,” says Antonio, who opened the butcher shop in Acqualagna, Italy 14 years ago. An elderly woman walks into Antonio’s butcher shop and doesn’t hesitate: she heads straight to him and says she needs a tender piece of meat for a special dinner that night. Talk to Antonio about most subjects, and it’s hard to get a straight answer. He constantly cracks jokes under his breath. Talk about meat, and he gets serious. “When you have a carcass in front of you, you have to know what to do – otherwise, you ruin it,” Antonio says, cutting the woman a slab of bottle-fed veal. The butcher shop is relatively new – this is a region where the Romans built a nearby bridge in 1 A. D., but Antonio has raised and hunted animals since he was a boy. Opening the butcher shop was a choice – working with animals is a way of life. 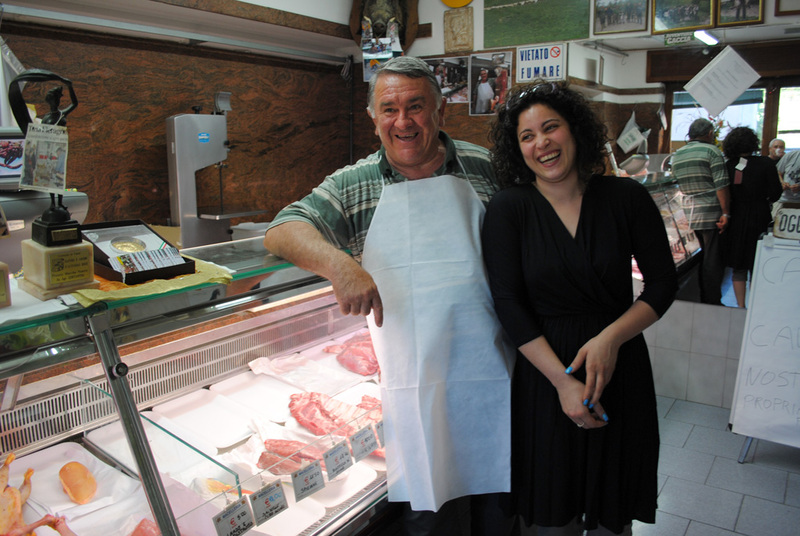 Antonio knows the quality of the meat he butchers is top-notch because he raised it all himself. His family has worked a sprawling farm on the hills between Cagli and Acqualagna since the 1800s. His family farm is currently home to 130 lambs and sheep, 100 pigs, 80 cows, and five horses. Horse or cavallo is commonly served in restaurants in the Marche region of Italy and is a staple of every good butcher shop. Antonio’s shop is known as one of the best in the area. 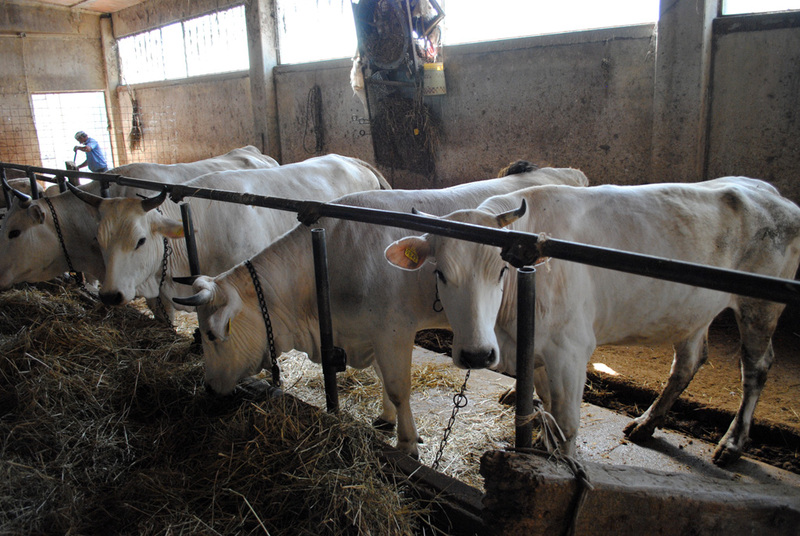 There are two other butcher shops in Acqualagna and four in nearby Cagli, Antonio says, but his shop is the only one where the animals are raised by the butcher. 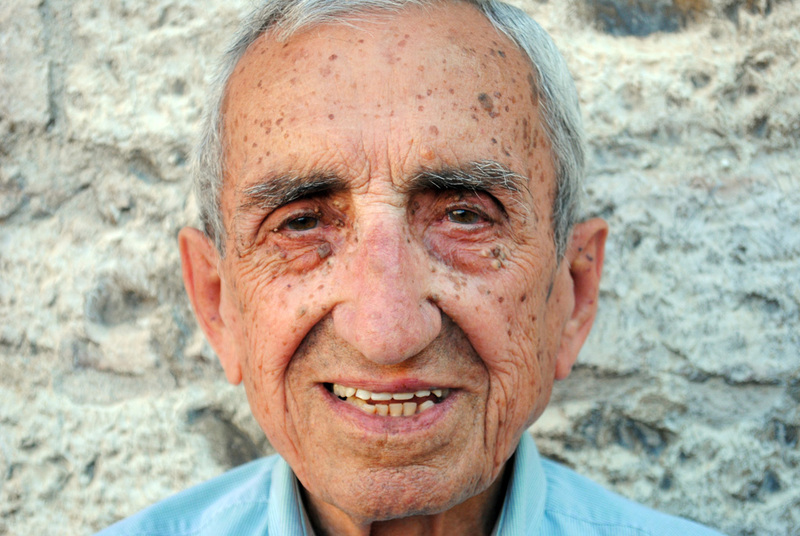 Single with no children of his own, Antonio lives on the family farm with nine family members. Antonio’s nephew Omar and Omar’s wife, Donatella, work in the butcher shop. Other family members work on the farm or have jobs in the area. The 30-something couple is atypical. Antonio worries that government red tape and taxes are driving the next generation out of farming. When Antonio was a child, working on the farm wasn’t an option – it was a requirement. Omar Constantini, left, and Antonio Constantini prepare pork for sausages at Antionio's butcher shop in Acqualagna. Photo by Tom Greene/Gonzaga in Cagli. Antonio Constanini peppers pork for sausage. Photo by Tom Greene/Gonzaga in Cagli. Omar Costantini, left, and Antonio Costantini put casing on pork sausages at Antonio's butcher shop. Photo by Tom Greene/Gonzaga in Cagli. 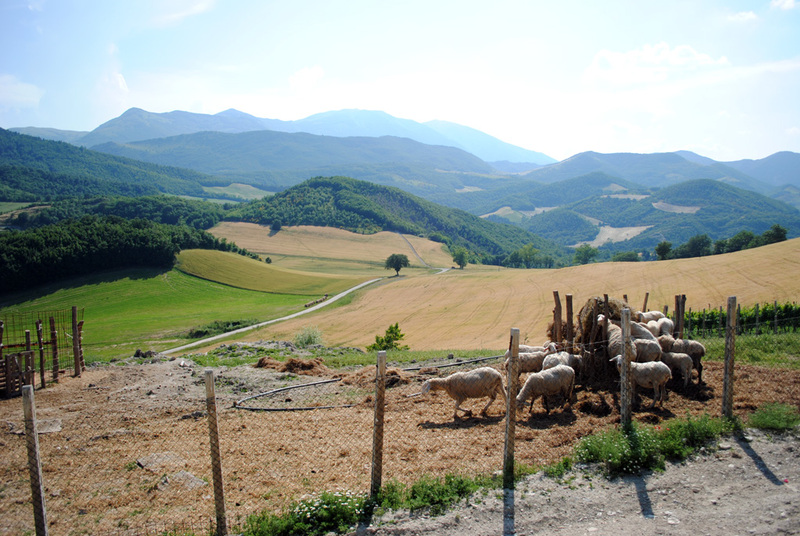 Sheep graze on the Costantini farm between Cagli and Acqualagna. Photo by Tom Greene/Gonzaga in Cagli. Cows inside a pen on the Costantini farm. Photo by Tom Greene/Gonzaga in Cagli. 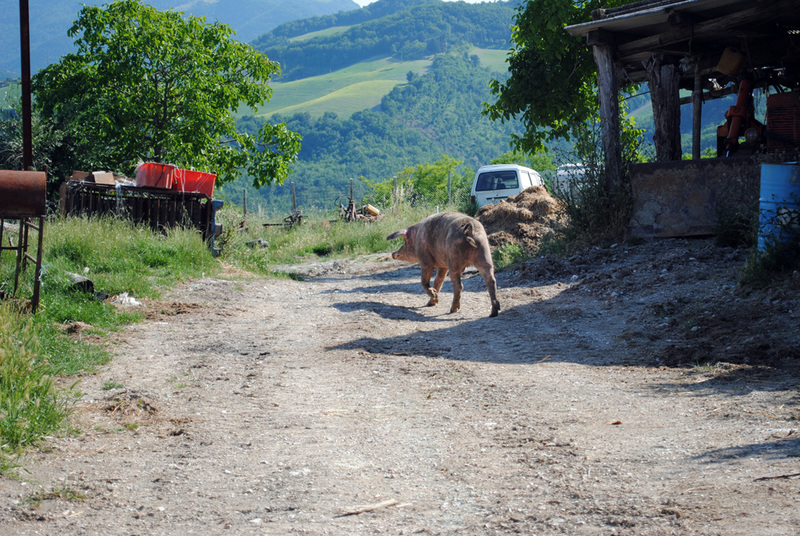 A pig walks down the road on the Costanini farm. Photo by Tom Greene/Gonzaga in Cagli. 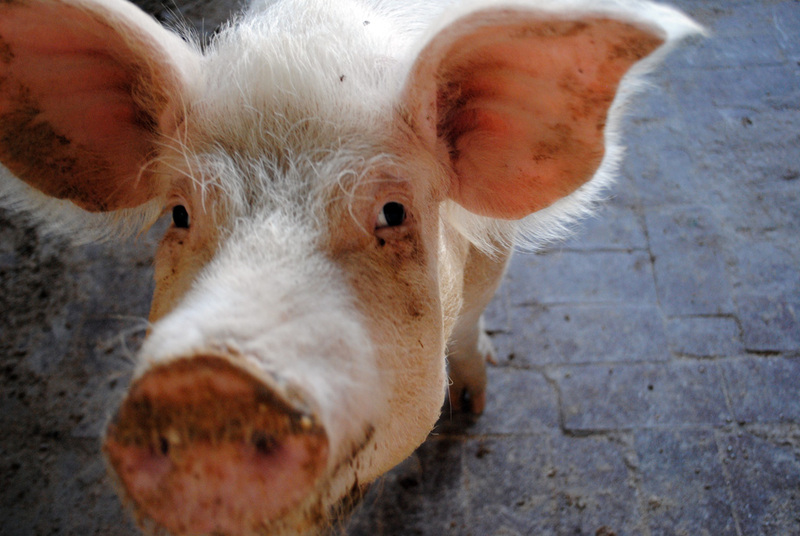 A pig hams it up for the camera on the Costantini farm. Photo by Tom Greene/Gonzaga in Cagli.